Sixty miles an hour at sea  the mile-a-minute craft is here, and New York to Liverpool in thirty hours is to be the next step. 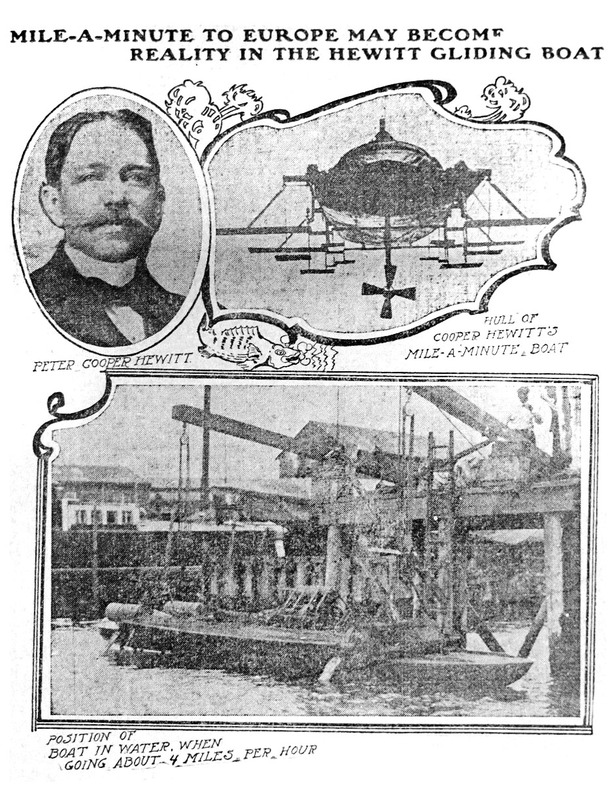 These are the amazing claims made by engineering experts for what is declared by them to be the most stupendous invention in the annals of speed -- a boat, or gliding craft, built, perfected and set afloat by Peter Cooper Hewitt, the discoverer of the famous "Cooper Hewitt" light. This new craft, aptly designated "gliding" does not cut the water as do other vessels, but actually flies or skims over and clear of the surface, the body of the craft being forced high enough to permit free play of the waves. "I have attained a speed of thirty-eight miles an hour with my model," said Mr. Cooper Hewitt in speaking of his invention, "under necessarily adverse conditions which always confront the early development of an idea. "I can build a one-hundred or a two-hundred-foot vessel which I can guarantee to go fifty-five miles an hour. As to further developments, I would prefer to take the predictions of the competent engineers who have seen my craft in its performances. Certain it is that these experts declare that the mile-a-minute craft is here." Like many other inventors who have been successful with their ideas, Mr. Cooper Hewitt set out for one destination and arrived at another. he started to build a flying machine and invented a marvelous gliding craft. he says he intends to build the air machine, but temporarily he is engrossed by the unexpectedly sensational performances of the gliding craft. This gliding craft, as Mr. Cooper Hewitt calls his vessel, is scow built, 27 feet over all, with a 4½-foot beam and carrying an eight-cylinder gasolene motor. The craft, casually inspected, is no more suggestive of almost incredible speed than is a freight ferry. This device, that looks like a scow and flies over the water, has a hull of mahogany. It is very shallow, merely a shell to carry the machinery when the craft is not moving. Mr. Hewitt's original plan called for two long, hollow air tanks mounted on a frame, catamaran fashion, but he found experimentation simpler with the shallow shell. A strong steel frame, similar to that of an automobile, extends over the sides of the shell and across either end, the cross sections of the frame, being equidistant from their respective ends of the craft. From each corner of the frame there are dropped into the water perpendicular steel arms. These arms extend eighteen inches below the bottom. To the arms are fastened steel planes, having a slant upward in front of about 1 in 8. The bottom submerged planes have two square feet of surface and those above it are larger. The total supporting surfaces of the four principal planes, therefore, is eight square feet. The motor is set forward and the single screw turns just back of the front set of planes. On either side of the shell is a gasolene tank. That's all there is of the craft and equipment. In operation the screw driving or pulling the craft forward forces the slightly slanted planes through the water and, on account of their slant, the craft is forced upward. The greater the speed the higher the craft rises. When it has reached a speed which forces the topmost vanes out of the water, or partly out, part of the supporting surface is lost and the craft settles lower, this principal constantly operating to maintain a perfect level for the shell at a given distance above the surface of the water. At from twelve to sixteen miles an hour the topmost planes leave the water, at thirty-five miles an hour all the planes are driven upward out of the water except the bottom ones. When gliding more than sixteen miles an hour the craft proper does no touch the water, but is carried above it. The effect is that of the shell being shoved along on four flat shoes., or skates. There is space between the top of the water and the bottom of the craft. This space is made great enough to allow for the play of the waves. As the waves do not touch the bottom of the craft. and as the principal planes are below the trough of the waves, there is a gliding instead of a rocking or pitching motion. If Mr. Hewitt's invention ever is applied to transatlantic vessels illness at sea will be unknown. The arms on which the planes are carried are made with a keen edge to the front and offer the minimum resistance. The hull, being above the water, offers no resistance, except to the air. When it is noted that in the case of a big steamship it requires eight times, or the cube of the power, to double the speed, and that in the Hewitt craft it requires but double the power to double the speed, the enormous speed possibilities become apparent. The Hewitt model craft weighs 2,630 pounds as it is. A boat of the same power and strength can be made weighing 1,500 pounds. Such a boat will carry a load of 1,500 pounds. it is estimated that the craft may carry sixty pounds a horsepower at a speed of thirty miles an hour, or even more. The Hewitt craft can be steered around the sharpest curves at high speed, and when this is done there is no loss of equilibrium, but the stern "skids" as do an automobile's rear wheels when driven fast on a sharp curve. "On carefull consideration of the art of flight, with reference to producing a flying machine, it becomes necessary to solve certain problems practically before it is possible to design a flying machine heavier than air that would be certain of success and be safe. "With this purpose in view, i turned my attention to water as a medium for my experiments, instead of air, and concluded that they could more advantageously be made in it than in air. Water possesses the advantage of greater weight. The weight of water is approximately 800 times the weight of air, therefore the supporting surfaces, such as wings or planes, would need only to be one eight-hundredth the size in water that would be required for the same effective lift and power as in air, and substantially the same rule applies to the propeller. "The water device, being so much smaller, brought the experiment within my available means at the time. I constructed a craft designed to run in water, which, when finished, had flotation means secured to it to support it while at rest, but in motion was lifted clear of the water and exercised no function in the action of the device except as so much dead load or weight. (1) Can a practical aeroplane device be made that will lift itself and proceed? (2) What size of plane and what angle of plane would be most advantageous to lift and sustain a given weight? (3) What would be the total weight and size of a device when constructed with the power necessary to lift itself with fuel and passenger, and what size and power would be most advantageous? (4) At what speed can such a device leave its early support and safely embark in its medium? (5) Can stability be safely maintained by an aeroplane device when in its medium and supporting itself by its power? (6) What practical change of size and angle should the supporting planes undergo with change of speed for greatest economy and safety? (7) What speeds are now practical and what speeds may be considered attainable in future? (8) Can such devices be made large? "To answer these questions and demonstrate possibilities, I constructed a gliding craft. 1. The device has proved not only capable of lifting itself, but of lifting two passengers, and has carried several hundred pounds of water in addition. 2. The angle of the planes varies, but the device supports itself and glides well on planes having a pith of, say, from one to seven to one to ten, and smaller angles will probably prove still better. 3. The total weight of the device is about 2,500 pounds. 4. The device is entirely supported by the planes at sixteen miles an hour, the flotation hull being entirely out of water at that speed. 5. The device is perfectly stable, safe and manageable. 6. The area of the planes should decrease with the speed for economy, speed and safety. They have a lifting power of about 300 pounds per square foot at thirty miles an hour. 7. The limitations of speed has so far been the propeller. More than fifty miles an hour are easily attainable on water this way, and I believe that more than one hundred can be safely looked forward to in the future. 8. The craft will greatly improve with increased size and can be made large. The water craft can be made to travel when large enough and be practically independent of the weather, and will have no motion from the waves. "The weight-supporting ability or lift of an inclined surface increases as the speed increases about in the same ration as the friction, so that by decreasing the area of the plane as the speed increases the friction tends to remain about constant for all speeds. This is the reason that very high speeds will be obtainable by these means, the laws governing it not being the same as those applicable to boats. "As the surface of an expanse of water is uneven and uncertain, it becomes necessary to straddle the surface so to speak; that is, have the main supporting planes below the surface and maintain the hull (or means of flotation while at rest) above the tops of the waves to play in between the two. This, in practice, can easily be done, so that a large craft in the roughest sea will practically glide the same as if in smooth water. "These experiments apply to air as well as water, only in air there is no turbulent surface to deal with, and for many reasons air appears to be the most desirable medium to use to travel in, as there are no floating logs or derelicts to run into. it becomes only necessary to increase the size of the present planes eight hundred times in order to enable the craft to travel exactly the same way in air and to provide a mechanical substitute for the surface of the water." "What are the immediate practical uses to which your discovery may be applied?" the inventor was asked. "I have been greatly impressed, aside from the peace aspects of the craft, of its possibilities in war. For torpedoes, torpedo boats and messenger boats the craft seems to be more than available. Experts tell us that in naval warfare guns, aside from small arms, cannot be used accurately on a vessel going faster than thirty miles an hour. So a torpedo boat running sixty miles an hour could do pretty much as it pleased. "Every experiment has indicated that the principal is better adapted to large rather than small vessels. It is too early yet to tell what future development of the demonstration may bring forth in trans-oceanic travel." "Do you think the time will come when the New York-Liverpool voyage can be made in thirty hours?" "The big problem now is that of propellers. Engineers will have to meet the advance in propeller designing for high-speed construction before that speed is attained."